Distal airways are less than 2 mm in diameter, comprising a relatively large cross-sectional area that allows for slower, laminar airflow. The airways include both membranous bronchioles and gas exchange ducts, and have been referred to in the past as the 'quiet zone', in part because these structures were felt to contribute little to lung mechanics and in part because they were difficult to study directly. More recent data suggest that distal airway dysfunction plays a significant role in acute respiratory distress syndrome. In addition, injurious mechanical ventilation strategies may contribute to distal airway dysfunction. The presence of elevated airway resistance, intrinsic positive end-expiratory pressure or a lower inflection point on a pressure–volume curve of the respiratory system may indicate the presence of impaired distal airway function. There are no proven specific treatments for distal airway dysfunction, and protective ventilation strategies to minimize distal airway injury may be the best therapeutic approach at this time. The lung can be partitioned into the airways and parenchyma. The airways form the conduits between the outside world and the primary gas exchanging unit, the alveolus. There are three major groups of intrapulmonary airways; cartilaginous bronchi, membranous bronchioles and gas exchange ducts. 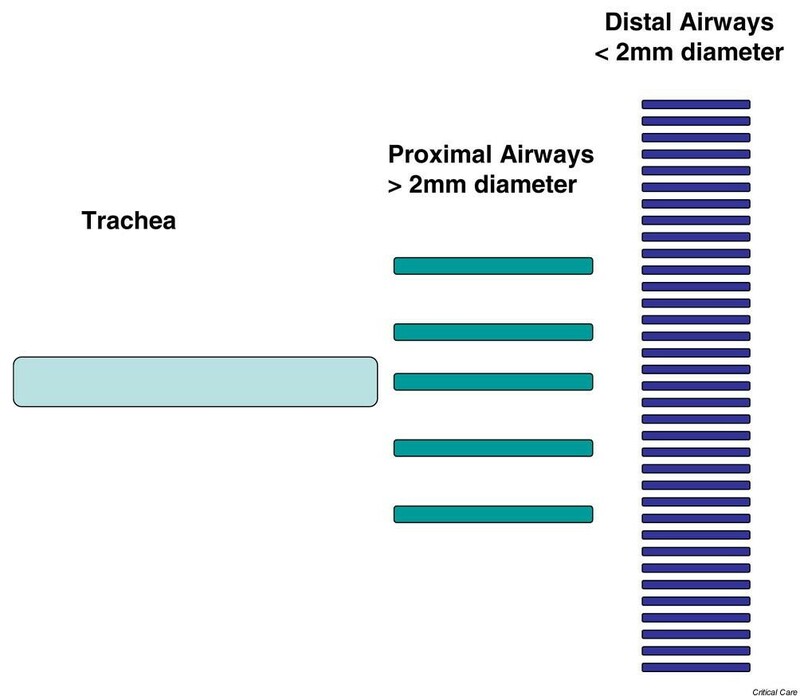 Distal airways, defined in this review as airways less than 2 mm in diameter, are comprised of both membranous bronchioles and gas exchange ducts . Because evaluating distal airways is challenging, relatively little has been published on their role in respiratory failure of various causes. In the present review we will highlight the experimental and clinical findings for the role of distal airways in acute respiratory distress syndrome (ARDS) as well as evaluating their function in mechanically ventilated patients. The trachea divides into two primary bronchi that enter the lung at each hilum. After entering the lungs the primary bronchi branch downward and outward repeatedly, giving rise to smaller bronchi, which results in a dramatic increase in the number of airways and a progressive decrease in the diameter of each airway (Figure 1). Eventually, bronchi enter a pulmonary lobule and are then termed a bronchiole. Bronchioles are intralobular airways with diameters less than 5 mm that branch into five to seven terminal bronchioles. Each terminal bronchiole subdivides into two or more respiratory bronchioles that transition into alveolar ducts. Alveolar ducts open into atria that communicate with alveolar sacs, which terminate into alveoli. Saclike structures measuring about 200 μm in diameter, alveoli can evaginate from respiratory bronchioles, alveolar ducts and alveolar sacs. For the purposes of this review, distal airways will refer to airways less than 2 mm in diameter that consist of small membranous, terminal and respiratory bronchioles as well as alveolar ducts. The small membranous and terminal bronchioles carry out conductive functions, whereas respiratory bronchioles and alveolar ducts can carry out both conducting and gas exchange functions. The diameters of individual airways become smaller toward the lung periphery but the number of airways increases dramatically. As a result, the total airway cross-sectional area increases markedly toward the alveoli and the gas velocities are lower. The large increase in airway number compensates for the smaller diameter of distal airways such that the distal airway cross-sectional area is very large and resistance is relatively low . In addition, distal airways are embedded in the connective tissue network of the lung, which allows transmission of tension from the parenchyma to distal airways. As lung volume increases, therefore, there is more tension on the distal airway walls, tending to increase their diameter. This leads to decreased airway resistance at higher lung volumes. Any pathological change in distal airway walls (that is, edema, inflammation) that blunts the transmission of parenchymal tension would increase the tendency to distal airway closure, especially low lung volumes. This property is sometimes referred to as mechanical interdependence. During normal breathing at functional residual capacity, distal airways contribute between 10% and 20% of the total lung resistance [1–3]. Of importance, however, is the fact that measured resistance is dependent on the frequency used to measure it. Lower frequencies reach distal airways more effectively than higher frequencies and show a greater contribution of distal airway resistance to total lung resistance . Nevertheless, in normal lungs, airflow in distal airways is laminar; in contrast to central airways, where it is turbulent. Table 1 summarizes some of the most important differences between distal and proximal airways. Other physiologically relevant characteristics of small airways in humans include the capacity for collateral ventilation via the pores of Kohn and hysteresis. Studies using beads to occlude small airways revealed the presence of collateral channels that allow gas to reach alveoli despite small airway occlusion. Therefore, before small airway obstruction affects the mechanical properties of the lung, it can affect ventilation perfusion matching . In addition, because of their small size and high compliance, distal airways can become unstable and close at low lung volumes, although some protection is conferred through hysteresis. Hysteresis refers to the property of the lung whereby higher transmural pressures are needed to keep the alveoli open at a given volume on the inflation limb as compared with the deflation limb. Most of the pressure–volume hysteresis of alveoli and distal airways is attributable to surfactant acting at the luminal gas–liquid interface [6, 7]. Surfactant, produced primarily in the alveolus, reduces surface tension at the luminal air–liquid interface and limits distal airways from closing at low lung volumes. Smooth muscle tone may also impact airway hysteresis . Residual volume increases with age, which is thought to reflect increased distal airway closure . In contrast to large proximal airways, distal airways have no cartilage or glands in their mucosa. The mucosal epithelium of the larger distal airways is ciliated pseudostratified columnar, which transitions to ciliated simple cuboidal in the terminal and respiratory bronchioles. Interspersed within the epithelium are nonciliated domed cells, called Clara cells , which serve as secretory cells [11, 12] and stem cells  for the distal airways. Bronchiolar submucosa contains a lamina propria that is composed of smooth muscle and elastic fibers. The smooth muscle is partially under the control of the vagus nerve (constriction) and the sympathetic nervous system (dilation). The alveolar ducts are lined with attenuated squamous cells, under which is the lamina propria. Smooth muscle cells lie within the lamina propria but disappear at the distal end of the alveolar duct. ARDS is characterized by pulmonary gas exchange and mechanical derangements [14–16]. There is disruption of the alveolar-capillary membrane due to vascular endothelial and alveolar epithelial injury, which enables a fibrin rich, proteinaceous fluid to leak from the capillaries into the interstitium and eventually flood alveoli. Plasma proteins (for example, fibrinogen, immunoglobulins) move into the alveolar space where they coalesce with cellular debris to form hyaline membranes . This is accompanied by infiltration of inflammatory cells, mostly neutrophils and macrophages . In addition, several studies have reported deficiencies in surfactant concentrations and composition/function in ARDS , which probably results from alveolar flooding by fluid and inflammatory cells . This constellation of alveolar alterations has profound consequences for pulmonary gas exchange and pulmonary mechanics. The profound shunt-induced hypoxemia has been recognized for decades , but recent publications have highlighted increases in the dead space fraction as well [15, 22]. The predominant mechanical derangements in ARDS are a decreased compliance (increased elastance) and an usually mild increase in resistance [21, 23, 24]. Both mechanical derangements in part reflect distal airway dysfunction. Decreased compliance in ARDS is probably due to alveolar and interstitial edema/inflammation resulting from the insult to the alveolo-capillary barrier. An additional probable contributor to decreased compliance is thought to be distal airway closure leading to an increase in the trapped gas volume . A significant contributor to the instability of distal airways is the loss of mechanical interdependence from interstitial edema and alveolar collapse , which blunts traction forces from adjoining alveoli/airways and promotes distal airway closure. In addition, surfactant dysfunction leads to an increase in luminal surface tension, which also promotes distal airway closure. Recent investigations explored the consequences of increased airway resistance in ARDS [16, 24, 27]. Using the negative expiratory pressure technique, investigators detected the presence of expiratory airflow limitation in ARDS patients without an antecedent history of airway disease [28, 29]. The negative expiratory pressure technique applies negative pressure to the expiratory circuit during exhalation, and failure to augment expiratory flow during this maneuver suggests flow limitation. The flow limitation occurred in the terminal third or less of the tidal volume and did not improve with bronchodilators . The investigators postulated that expiratory flow limitation was in part attributable to increased airway resistance. Several investigators have also detected the presence of intrinsic positive end-expiratory pressure (PEEP) as a marker of dynamic hyperinflation in ARDS patients [28, 30, 31]. The mechanism(s) for increased resistance, expiratory flow limitation and dynamic hyperinflation are not clear but probably relate to multiple factors. The function residual capacity in ARDS is reduced, predominantly due to alveolar edema and atelectasis, which leads to an attendant decrement in elastic recoil and maximal expiratory airflow. The fall in lung volume and surfactant dysfunction  also promotes small airway closure  and gas trapping [25, 31], which are exacerbated by patients lying predominantly in the decubitus position [28, 33]. Small airway closure contributes to the fall in expiratory airflow and facilitates the development of intrinsic PEEP and hyperinflation. 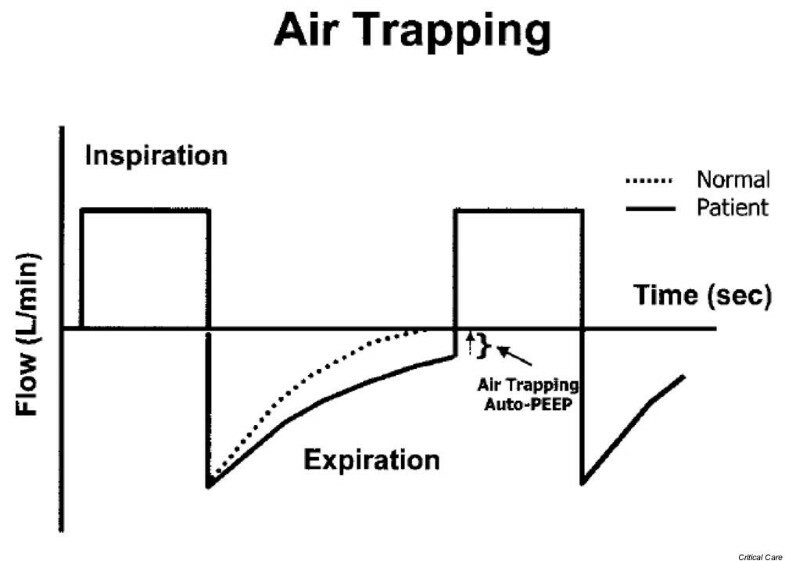 The application of extrinsic PEEP can decrease expiratory resistance and intrinsic PEEP, probably by preventing small airway closure [34, 35]. The contribution of proximal airway edema/inflammation and bronchoconstriction to increased airway resistance has not been well studied and remains speculative. The behavior of normal lungs during mechanical ventilation (MV) remains incompletely understood. The long-held theory of alveolar expansion and contraction in a balloon-like fashion represents an oversimplification. Some investigators postulate that alveoli may exist in a state in which lung volume changes have negligible changes in alveolar size, but rather change the ratio of inflated to deflated alveoli. In this view, ventilation occurs primarily with changes in alveolar duct size or conformational changes, similar to the crumpling and uncrumpling of a paper bag [36–38]. MV can induce injury to intact lungs by both high-volume ventilation and low-volume ventilation, referred to as volutrauma and atelectrauma . Volutrauma occurs when the lung is overinflated and the alveoli overstretched. Atelectrauma refers to injury at low lung volumes and is thought to be due to repetitive opening and closing of recruitable alveoli and distal airways, which leads to very high shear stress injury. There has been relatively little information published about the direct impact of volutrauma on distal airway function, but it is probable that overstretching injures respiratory bronchioles and alveolar ducts as well as the alveolar–capillary membrane. Experiments performed in the 1970s revealed that animals undergoing MV with peak airway pressures of 45 cmH2O developed severe pulmonary edema whereas animals ventilated with peak airway pressures of 14 cmH2O did not develop edema . Subsequent experiments revealed that this injury was dependent on the end-inspiratory volume more than on the end-inspiratory pressure. This was clarified by experiments in which rats underwent thoracoabdominal strapping and were ventilated with identical peak airway pressures but small tidal volumes and were then compared with animals ventilated with identical peak airway pressures without strapping, which resulted in much higher tidal volumes. No pulmonary edema or ultrastructural abnormalities were seen in the strapped animals  in contrast to the nonstrapped animals. Light microscopic examination of lungs ventilated with high tidal volumes revealed diffuse alveolar damage with hyaline membranes, alveolar hemorrhage and inflammatory cell infiltration . Electron microscopic examination of lungs ventilated with high tidal volumes revealed diffuse endothelial and alveolar type 1 cell injury . There was relatively little comment on distal airway pathology, but the similarities in alveolar–capillary pathology between MV-induced pulmonary edema and human ARDS  would predict similar distal airway findings in MV-induced pulmonary edema. It was initially thought that healthy lungs tolerate MV at low lung volumes for prolonged periods without damage , but recent evidence suggests that MV at low lung volumes can induce lung injury . Early experiments in normal rabbits tested the effect of repetitive collapse and reopening of distal airways induced by negative intrathoracic pressure. After 1 hour of negative-pressure MV there was decreased gas exchange and increased elastance, but no apparent histologic injury . If the duration of low-volume MV is extended to 3–4 hours, however, one can detect increases in airways and viscoelastic resistance as well as histological evidence of distal airway injury [47, 48]. The distal airway injury is reflected by epithelial desquamation in the terminal and respiratory bronchioles with surprising little alveolar injury . The investigators did not observe inflammatory cell infiltration into the airways or increased proinflammatory cytokines in alveolar fluid. They interpreted this to indicate the earliest distal airway injury results primarily from mechanical injury related to repetitive opening and closing of distal airways . The implications of these animal studies on ventilating normal human lungs is unclear as little has been published on the impact of low-volume ventilation of normal human lungs. Many investigators have studied the impact of MV on pre-existing lung injury, and the consensus seems to be that diseased lungs are more susceptible to the detrimental effects of MV. In a rat model of α-naphthylthiourea-induced lung injury, the addition of high-volume MV (45 ml/kg body weight) resulted in more severe edema than each insult alone, indicating synergism of injury . It was suggested that the synergism was due to alveolar flooding, which reduced the number of available alveoli to receive the tidal volume, thus exposing them to overstretching. This made them more susceptible to injury and alveolar flooding and established a positive feedback loop. Similar findings have been reported in isolated lung injury models [50, 51]. Animal experiments suggest that inflation volumes necessary to cause overstretch injury are much larger than those in common clinical use , but the ARDS lung is heterogeneous with areas of edematous and atelectatic lung interspersed with 'normal' lung. To explore the role of lung heterogeneity in lung injury, investigators instilled normal saline through the trachea and flooded rat alveoli. Although this alone did not induce lung injury, significant injury was detected when it was followed by MV for 10 minutes. The degree of injury, as assessed by capillary permeability, was related to the elastance of the lung prior to initiating MV, suggesting that MV-induced injury was related to the number of available alveoli . Even normal tidal volumes may therefore lead to increased shearing, regional overinflation and perpetuation of lung injury . The importance of reducing volutrauma in ARDS patients was demonstrated in the low-tidal-volume Acute Respiratory Distress Syndrome Network (ARDSNet) trial, in which there was a 22% relative risk reduction in mortality in using 6 ml/kg tidal volume compared with 12 mg/kg tidal volume . The inspiratory pressure–volume curve of ARDS patients often displays an abrupt increase in compliance at low lung volumes, which is referred to as the lower inflection point (LIP)  (Figure 2). The LIP has historically been thought to reflect opening of previously closed distal airway units and is often associated, clinically, with improved oxygenation. There have been concerns that in an injured lung, where there is distal airway closure (see above) and increased gas trapping, the repetitive opening and closing by MV could induce high shear stress  and pressure gradients leading to epithelial damage . Lung with the acute respiratory distress syndrome can develop a lower inflection point. Pressure–volume curves of (a) a normal lung and (b) an acutely injured lung. The lower inflection point (LIP) is indicated. Adapted with permission from Luecke and colleagues . The role of low-volume ventilation exacerbating pre-existent lung injury has been explored in both isolated lung and animal models. In an ex vivo model of lavaged rat lung, ventilation with physiological tidal volumes from zero or low PEEP resulted in significant injury to the terminal and respiratory bronchioles and alveolar ducts relative to ventilation from a higher PEEP . Similar results were found in intact rats whose lungs were depleted of surfactant by lavage. Animals whose PEEP was set below the LIP were compared with those with PEEP set above the LIP. The animals with the lower PEEP had worse compliance, more atelectasis, lower PaO2, and more hyaline membranes [60–62]. More recently, investigators used in vivo video microscopy to assess alveolar stability after surfactant deactivation in pigs . In the control group ventilated with no PEEP, alveoli became unstable (closed and opened with tidal ventilation) within 5 minutes and remained unstable for 4 hours. In contrast, the alveoli remained stable in pigs that were ventilated with PEEP. The stabilization of alveoli was associated with improved lung function and histologic injury. There was no difference in plasma or bronchoalveolar lavage TNFα levels. Finally, in one study that reported distal airway histology, distal airway injury was significantly worse in the low-PEEP group of animals . Interestingly there was no gravitational gradient to distal airway injury, in contrast to alveolar injury – which was worse in the nondependent, nonatelectatic regions. The mechanisms responsible for low-volume injury are not clear, but mechanical forces such as shear stress and the pressure gradient on the epithelium are thought to play important roles [36, 58]. The plasma membrane can compensate for mechanical stress by multiple mechanisms such as unfolding and by increasing lipid trafficking to the plasma membrane . Cell injury occurs when these compensatory mechanisms fail and lead to plasma membrane defects. Surfactant can substantially reduce local airway epithelial pressure/shear stress and protect epithelial cells from injury . The pathophysiologic correlate for the presence of LIP in injured lungs has been challenged recently by investigators using data from oleic-acid-injured dog lungs . They proposed that the presence of an LIP in injured lungs is the result of internal stresses in the lung caused by high surface tension and the presence of fluid in the airways and alveoli. With increasing pressures there is displacement of the air–liquid interface along the distal airways into the alveolus until a threshold pressure is reached above which there is a rapid increase in alveolar volume. Investigators have shown, however, that even in this model there is a dynamic stress imparted to the airway epithelium causing severe cellular deformation . Regardless of the exact mechanism contributing to the LIP, ventilating injured lungs cause shear stress to epithelial cells. The clinical importance of PEEP has been questioned by some with the recent failure of the ARDSNet high PEEP vs low PEEP trial to show any difference in mortality . It must be pointed out, however, that PEEP decisions in this trial were not made with reference to an individual's LIP. Therefore it is possible that beneficial effects of recruiting could have been antagonized by overdistension of terminal units . Furthermore, two trials in which PEEP decisions were made in reference to an individual's LIP have reported a mortality benefit [68, 69] with higher PEEP. Distal airway dysfunction can impact several aspects of pulmonary mechanics that can be detected in mechanically ventilated patients at the bedside. In the past decade the ability to display pressure–time, flow–time and volume–time waveforms as well as pressure–volume and flow–volume loops has become routinely available in most modern ventilators. This allows measurement of static and dynamic compliance, inspiratory and expiratory resistance and intrinsic PEEP. The predominant mechanical derangement in ARDS is a fall in static compliance, although increases in airway resistance have also been documented (see above). Both static compliance and airway resistance can be assessed by rapidly occluding the expiratory port after a tidal breath during controlled MV. A caveat to interpreting data using this maneuver is that the patient must be relaxed and in synchrony with the ventilator. Following airway occlusion there is an immediate drop in the peak airway pressure (Ppeak) to a lower initial pressure (Pinit). The pressure then declines gradually to reach a plateau after 3–5 seconds (Pplat) (Figure 3). Pinit can be determined by back-extrapolation of the slope of the latter part of the airway waveform to the time of airway occlusion. Static compliance is determined by dividing the tidal volume by the difference in Pplat and PEEP (Table 2). The total lung resistance can be calculated by dividing the difference in Ppeak and Pplat by the inspiratory flow rate (V). The resistance can be further partitioned into the resistance of the airways, (Ppeak - Pinit)/V, and the resistance attributable to the viscoelastic properties of lung tissues, (Pinit - Pplat)/V. An elevated airway resistance in ARDS patients may in part reflect distal airway dysfunction, but is probably also related to pathology in the large airways and airway secretions. Flow, inspiratory flow rate; PEEP, positive end-expiratory pressure; Pinit = initial pressure; Ppeak = peak airway pressure; Pplat = plateau pressure. Peak and plateau pressures in mechanically ventilated patients. 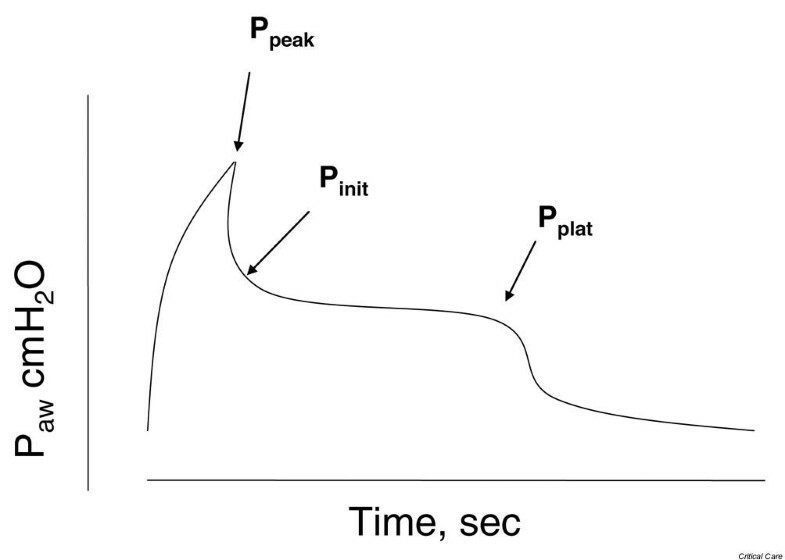 When the airway is occluded at end-inspiration, the airway pressure declines rapidly from a peak (Ppeak) to a lower initial pressure (Pinit), followed by a gradual decrease to a plateau pressure (Pplat). Abnormalities in dynamic compliance predominantly reflect distal airway injury. This can be detected by examining pressure–volume curves for the presence of a LIP. The presence of a LIP, often seen as a 'knee' in the pressure–volume curve, is indicated by a dramatic increase in compliance in the inspiratory limb of the pressure–volume curve (Figure 2). The LIP is felt to represent the pressure at which there is massive opening of collapsed distal airways, although the exact pathophysiologic correlate is debated (see above discussion). It has been proposed that a patient's measured LIP be used to set the exogenous PEEP above the LIP  in order to lessen injury to small airways by limiting atelectrauma. The ARDSNet trial that compared high PEEP with low PEEP failed to answer this question since a subject's LIP was not used to set the PEEP in either arm of the study . Two studies in which the LIP was used to guide PEEP selection were associated with improved survival [68, 69]. The rapid airway-occlusion technique can also be performed at end-exhalation to detect intrinsic PEEP and dynamic hyperinflation. In the presence of dynamic hyperinflation, this maneuver will lead to an increase in airway pressure that plateaus at a value reflecting the average intrinsic PEEP. It is important to remember that intrinsic PEEP may not be accurately detected if the exogenous PEEP is greater than the intrinsic PEEP. Consequently, if intrinsic PEEP is suspected then the exogenous PEEP needs to be discontinued to accurately assess the intrinsic PEEP. The presence of intrinsic PEEP can be suspected if expiratory flow persists at end-exhalation, giving a truncated appearance to the expiratory flow loop (Figure 4). Expiratory flow limitation from distal airway dysfunction is a probable contributor to the development of intrinsic PEEP in ARDS, but there are other contributors as well. These may include proximal airway pathology, and ventilator settings that limit the expiratory time (that is, high respiratory rate). In experimental settings, airflow limitation can be detected by the negative expiratory pressure technique. Failure to augment expiratory flow after application of negative pressure to the airway circuit suggests airflow limitation, which usually occurs in the distal airways. Expiratory flow and detecting intrinsic positive end expiratory pressure. Intrinsic positive end-expiratory pressure (PEEP) is present if the expiratory flow does not reach zero before initiation of the next breath. PEEP can be suspected by the appearance of a truncated expiratory loop. Reproduced with permission from Dhand . The distal airways have been referred to in the past as the quiet zone , in part because these structures were felt to contribute little to lung mechanics and in part because they were difficult to study directly. Recent data suggest, however, that airways less than 2 mm in diameter play significant roles in the pathophysiology of ARDS and MV-induced lung injury. Distal airway dysfunction in mechanically ventilated patients can be detected by evaluating ventilator pressures and waveforms, although care must be taken to interpret them appropriately.